As trainers, we are rewarded on a daily basis through changing people’s lives for the better. The results gained by our clients keep the fire in our bellies burning and makes us realise how important quality of life is for so many people. All our clients have transformed their lives in one way or another. The following clients have been chosen for our transformation package because of the outstanding lifestyle changes they have made to improve the quality of their lives! These transformations are not just about the “before and after”, the amount of weight lost or dramatic unsustainable changes. As you will see in the following testimonials, the benefits are about a variety of positive life changes, such as an improvement in physical fitness, physical health, confidence and self esteem. These guys have become more ambitious and continue to set goals for themselves. We have not used photo-shop or altered the “after” images in any way. The clients all provided their own “before” photos and the testimonials are in their own words. We thank them deeply as it takes great courage to put yourself out there in the public eye, particularly the use of the before photos! Congratulations to Rohan, Chris, Tanya, Kim and Sallie! My life was grand, eat what I want, drink as much beer as I want and occasionally do a big heavy weight training session. 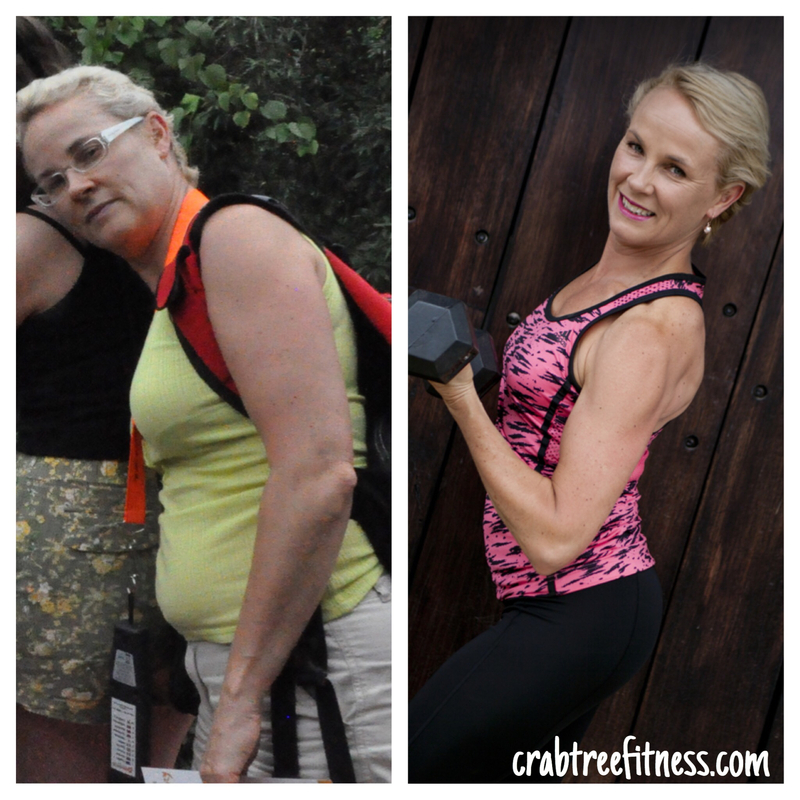 I thought I was in good shape and living the dream, until my wife enrolled my daughter and I into Crabtree Fitness Bootcamp, I didn’t know what to expect but as you can see it turned my life around! I thought my nutrition was good but Jac and Paul told me to keep a food diary and they were able to tune a few things (okay, they reconstructed everything completely). The first couple of weeks were a real grind, man I was sore. Soon the weeks turned into months and the grind turned to trying to push myself harder and harder. The atmosphere at bootcamp is awesome. Life’s better since losing 19kg; no more cycling shorts under my work pants to stop my legs from rubbing, energy levels have gone through the roof. It wasn’t easy but I know it was worth it. I was a Stay at Home Mum with 2 girls and I wasn’t doing any exercise at all. I decided that the time had come to get fit and healthy, a big task really given I’d never exercised in my life and was actually very lazy. It was 39 degrees on the day I did my very first bootcamp and all I could think was “what on earth am I doing” but at the same time I enjoyed getting out and doing something for me. I joined the Mum’s (and a few Dad’s) 9am bootcamp which worked perfectly because I could do the school drop off and then go straight to bootcamp and I could also take my youngest child with me and she played with other kids while I was exercising. There was no excuse not to go because I was already out of the house anyway. The first few months were tough, at the start I couldn’t even run a warm up lap of the oval, but everyone was so encouraging and supportive. It was a big surprise after a few months to find that I was enjoying bootcamp and more to the point I could see an improvement in my fitness. I’ve been going to bootcamp for 2 years now (I even moved to 6.15am sessions when I was studying and couldn’t get to the 9am sessions) and over that time my fitness has improved greatly and in the process I’ve lost 8kg which has been an added bonus. Thanks Jackie and Paul, I totally recommend Crabtree Fitness because honestly, if I can do it, and enjoy it, anyone can! I have been having personal training with Crabtree Fitness since May of this year. Over the last few years I had been putting everyone and everything in front of myself. I slowly watched the scales creep up but kept telling myself I would lose the weight soon. When I jumped on the scales and realised that I was even heavier than when I was pregnant I knew it was time to do something about it. I had mentioned to my husband that maybe a personal trainer was the way to go. He was so supportive and encouraging that he gave me the Personal Training sessions with Jackie as my birthday present. I had tried fitness sessions/bootcamps in the past and ended up losing my motivation and in some cases injured. I was a little hesitant to have another go as I didn’t want to injure myself again. I had many friends mention Jackie and Paul and how much they had enjoyed going to their sessions. I finally picked up the phone and called. From that first conversation, Jackie has been fantastic. She was so supportive and I love her practical approach to nutrition and exercise. She has been able to tailor my weekly workouts to my level and to help me work on my technique so that I didn’t injure myself again. Not only has my fitness and core strength improved, so has my confidence in my own ability to push myself. Since starting Crabtree Fitness I have lost 14kg. The training sessions with Jackie gave me the confidence to start running and set myself the goal of doing a 5km fun run before I was 40. I still have a few months to go however I have achieved my goal by doing not one, but two fun runs, as well as a few laps around Lake Wendouree. Things I never thought I would achieve. Thank you Jackie and Paul for all your help and support. I had been living a sedentary lifestyle for years and thought I was too busy to fit in any exercise with long hours of work and a young family keeping me busy. A dodgy knee stopped me from playing football and was another excuse for not exercising. A regular check-up with the doctor confirmed my cholesterol was out of whack and that was the second time I had received that news so I thought I really need to do something about this. A friend said come along and give this boot camp a try and I have hardly missed a session for the last 20 months. I have found Jackie and Paul to be great trainers and I enjoy the variety in the workouts. There is no yelling or screaming but rather support, advice and encouragement which works for me. One of the most important things I have done is make the boot camps priority and actually plan my week around them rather than tyring to squeeze them in around other commitments. The early morning boot camps help with this. I have lost around 12kg and my cholesterol is back to normal. I feel fit and healthy and most importantly I am setting a good example for my kids. New clothes are costing me a small fortune but also gives me great satisfaction when the old ones are just too big now. I have been a regular exerciser for many years and tried everything from all codes of aerobics classes to running a marathon 10 years ago….basically I got bored easily. I joined Jackie and Paul in September 2012 and have never been bored yet!! The variety that they tap into week after week is exceptional and the manner in which they combine strength and cardio work is a real winner for me! This year though I wanted to step it up a notch. Jackie helped me work towards my goal of building a six pack and gaining a 10 on the beep test. She also gave me invaluable nutritional advice. Seven months later I feel the fittest I have in years. I love going to bootcamp 3 mornings a week with the fabulous morning crew and for the past 4 months have been doing some PT with Jackie with the focus of building muscle. I cannot thank Jackie and Paul enough for all they have done for me over the past 3 years. They well and truly have gone above and beyond with absolute passion for what they do!! My career is moving me to Bendigo next year and I only hope I find fitness professionals with the same knowledge, care and philosophy!